The all inclusive (excluding drinks) package is $5,700 per person ($200 discount if you pay by wire or check) for a shared double cabin in a well equipped river cruiser with air conditioning and private bath. Paddleboard rental and excursions, daily guided treks, and naturalist-led canoe exploration is part of the package. EXPEDITION OVERVIEW Join us for a ski-driven journey to the Antarctic Peninsula. An exclusive 8 passenger ski-mountaineering experience in the Southern Ocean’s most dramatic amphitheater of snow, ice and wildlife, this intimate adventure is designed to maximize exploration and ski objectives amidst the stunning terrain of the Peninsula’s most attractive peaks. $52,000 USD, price based on 5 clients. 5% increase after Nov 30, 2018. Having skied Russia, the Alps, Alaska, Argentina and most places in between, I can say with great pride that skiing in Antarctica was the trip of a lifetime! The overall experience took my breath away and, as we left this magical place, I found myself already searching for ways to return as soon as possible. Ice Axe’s professionalism and commitment to sharing life enriching experiences was a major factor in the success of this trip. Doug Stoup is a master orchestrator! Prior to even leaving home, my expectations for this trip were already sky-high, but I couldn’t have even fathomed how magnificent this trip would truly end up being. The Antarctic will take your breath away with its natural beauty and enchanting wildlife. Ice Axe’s professionalism as well as their commitment to make everybody’s trip one that will always be remembered, also soared beyond my expectations. I am already plotting how I can get back there with them in 2011. Doug Stoup and Ice Axe changed my life. 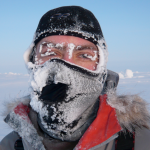 By guiding me to the Geographic North Pole I fulfilled a lifelong ambition to achieve something extraordinary. I was also able to raise over $40,000 for UK cancer charity Macmillan, which supported my Dad through his fight against terminal lung cancer. To reach the North Pole in his memory and to help others win their fight, was my life’s most fulfilling achievement. Doug was an amazing guide and mentor who taught me so much about leadership and humility as well as survival. I now work as a professional speaker, inspiring others to do extraordinary things for charity and themselves. I plan to reach the South Pole in January 2012. As a veteran outdoor adventure journalist of 30 years I’ve prided myself on my travels – whether it be heavy weather Trans oceanic crossings; climbing forbidding peaks; skiing Yosemite backcountry, or expeditions into Central American rainforests. 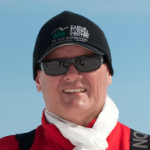 My wonderful and high-octane adventures to Antarctica with expedition leader Doug Stoup during the Ice Axe 2009 Ski Cruise made any of my past accomplishments pale in comparison. From the moment I stepped aboard our ship headed toward the “White Continent” I knew that my life would never be the same, only richer in experience. From first sightings, the Antarctic Peninsula proved so otherworldly it was as if our ship had wandered through a window into a prehistoric earth that wore the aspect of an unknown planet. Indeed, it was astonishing: a world of surpassing beauty, so perfect and intense that at first I couldn’t imagine my return to modern life. But what really made this a trip of a lifetime wasn’t as much the splendid Southern Oceanic scenery and wildlife, but the fun, safe and professional leadership of Doug Stoup and his staff. My goal is to return to Antarctica with Doug for more adventures and good times. If only more guide services offered such complete and rewarding trips!